Our company is highly cherished of being a noteworthy service provider of Commercial Interior Turnkey Project Services. In this service, we offer numerous types of designing including lightening, floor designing, wall designing and furnishing. The service that we offer is cost effective and aesthetic, as it is rendered under the surveillance of a team of creative professionals making use of advanced techniques. Moreover, this service is highly demanded for its timeliness and trustworthiness. 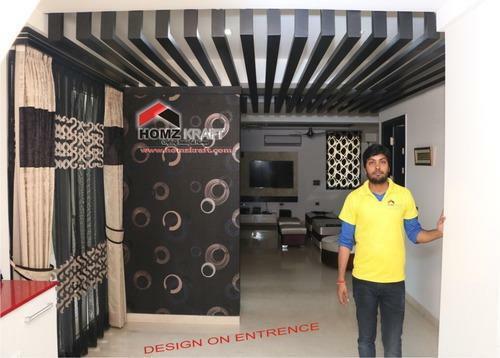 “Homzkraft”, is a reliable Service Provider that is affianced in providing Kitchen Design Services, Wardrobe Design Services, Bedroom Design Services, Bathroom Design Services, Interior Designing Services, Living Room Design Services and Interior Design Turnkey Project Services. We are a Partnership Firm, which is incorporated in the year 2015, and providing reliable and well managed designing services in residential places, hotels, offices, etc. Located at Noida (Uttar Pradesh, India), we are managed under the headship of our Mentor, “Mr. Sumit Aggarwal”, and are able to gain a massive success across the nation.